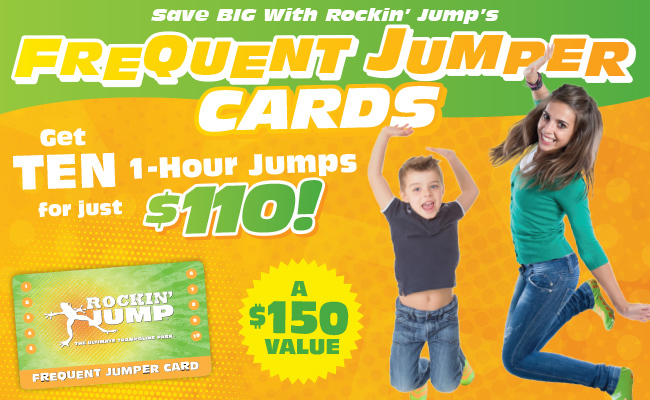 Stretch your dollars farther with the Rockin' Jump Frequent Jumper Card! Your Frequent Jumper Card can be used for multiple people: Friends, Family Members, No restrictions. Get $150 value for $110! We are trampolines on steroids!! One of the largest trampolines parks in the United States is right here in Carol Stream! We bring the FUN to Carol Stream!! Our motto is "FITNESS DESIGNED AS FUN!" Come for jumping, leaping, jousting, climbing & flipping! Enjoy our Dodgeball court, hundreds of square feet of trampolines, basketball arena and our 24" Vertical Ops Climbing Wall! You will also find our world famous X-Beam Battle Zone (think American Gladiators!) and a huge foam pit you can leap into! Kids of all ages love the fun! In the ValoJump arena, you can immerse yourself as a character in your own jumping video game! Check out our park online for more pictures and videos!